On May 12, 2006, Richard E. Grant unveiled his film Wah-Wah as part of the American Film Institute and Audi Corporation Director’s Series at the Arclight Theatre in Hollywood. When I went, I didn’t know much about the film or the event. As it turns out, I was at a premiere and in the good company of Eric Idle, Julian Sands, Leonard Maltin, Michael York, Tracey Ullman, and the writer/director himself. Steve Martin moderated the Q&A (Grant played the uptight foil to Martin’s wacky weatherman in L.A. Story). All in all, not bad for a Tuesday night in Los Angeles. Older moviegoers may remember Grant’s breakthrough starring role in Withnail and I. He has also compiled an impressive variety of film and television credits, and he has written two novels about his exploits in entertainment. Grant can now proudly add screenwriter and director to his resume. Wah-Wah tells the story of Ralph Compton, a boy growing up in the waning days of colonial Swaziland. It stars Miranda Richardson (Black Adder) as his mother Lauren, Gabriel Byrne (The Usual Suspects) as his father Harry, and Emily Watson (Punch Drunk Love) as his stepmother Ruby. Zachary Fox and Nicholas Hoult play Ralph, in various stages of adolescence. The film opens as the country gains its independence from the United Kingdom. At the same time, the Compton family is coming apart at the seams. Following Lauren’s (Richardson) adultery and abandonment, Harry (Byrne) briefly sends Ralph to boarding school as he descends into alcoholism and violent rage. Ralph returns to find his father remarried to the American, Ruby. This family subplot is a nice counterpoint to the larger storyline of impending cultural and professional displacement of the colonial governing class. Colonialism and colonial decay is not a new subject in film. When we see it through Ralph’s adolescent eyes — how he tries to understand the changes to his world — we instinctively empathize with him. Beyond Ralph’s growing pains, the audience experiences the interplay of anguish among the supporting characters as they attempt to hang on to the life they knew. Seeing the family — and the society — unravel from Ralph’s perspective is what makes this colonial period/coming of age piece both interesting and empathetic. The most poignant example of this is the complex dynamic of his parents’ love as it unravels. Furthermore, throughout the film, we understand the tendency to want to hang on to old love and old ways. This tendency threatens Harry’s marriage to Ruby, as well as his professional reputation. Thus, the film contains an important moral about letting go and moving on. However, the film’s epiphanies, just as real in life, do not become clear almost until the bitter end. The events in the story are true. The names have been changed to protect the innocent (or lecherous, as the case may be). During the Q&A, Grant revealed the film was an autobiographical piece based on his own boyhood in colonial Swaziland. What is most refreshing about this movie is that, in a business where stars often avoid getting personal, Grant lays bare all the details, esoterica, and the accompanying social and psychological consequences of the events — including how he developed, and then cured, his nervous tick. The film also turns out to be a family effort, which features the acting debut of Grant’s daughter, Olivia. Grant’s wife, Joan Washington, a dialect coach, also worked with Emily Watson on her American accent during this film. As a new director, Grant is doing publicity from that perspective for the first time. 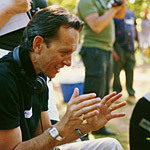 When asked to comment on his transition from acting to directing, Grant said, “It’s the perfect job for me as a detail-oriented masochist.” Once the laughter died down, Grant revealed that a lot of what he learned about directing came from taking direction as an actor from the likes of Francis Ford Coppola and Robert Altman, to name a few. If you want to know more about Grant’s film exploits, click on our link to Amazon and pick up With Nails: The Film Diaries of Richard E. Grant and The Wah-Wah Diaries.